Rating: My favorite CTM (Chicken Tikka Masala). For 13 or so years Akbar has been one of my favorite Indian restaurants. Too many Indian places focus on low cost buffets of very over cooked food, but Akbar cooks everything to order — even baking their own Naan when you place the order. 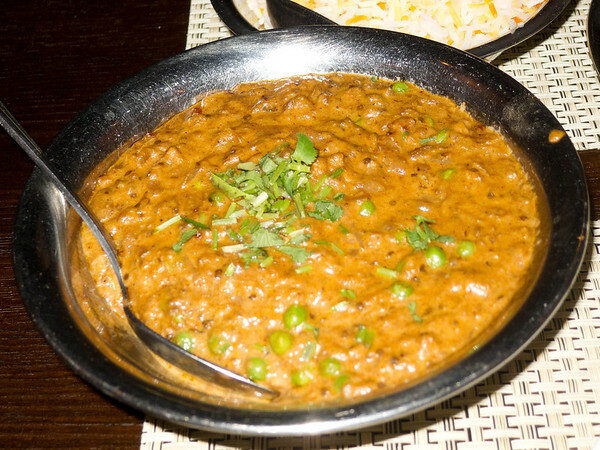 They are more focused on the cuisine of the Punjab (Northern India), with very good curries and kormas. You can get anything from extremely mild to blow the top of your head off. Once I had the “pepper lamb” on 5 (max heat) and my scalp sweat for hours. 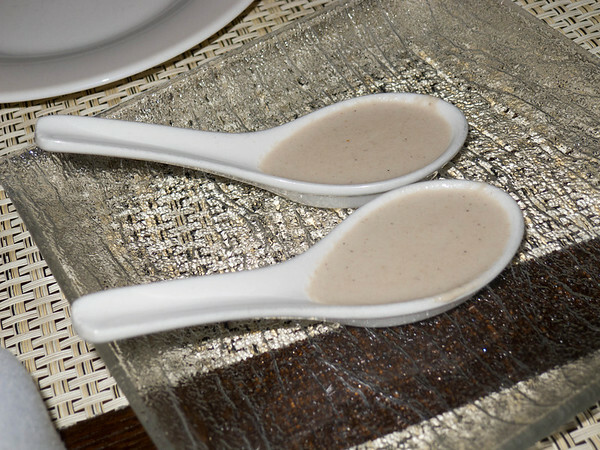 Today they have us these spoonfuls of mushroom creme soup as an “amuse.” Much like any mushroom creme soup, but with a hint of spice — and spices. 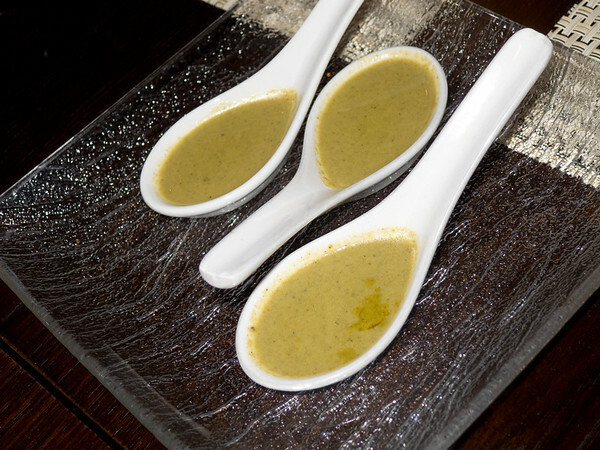 Spinach soup, a similar but slightly different amuse on a different day. 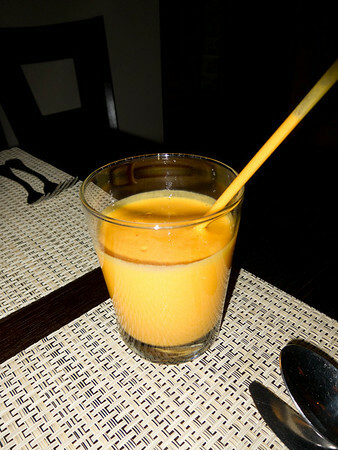 As I was still hung over from the previous night’s massive Truffle Fest (SEE HERE), I had only a mango lassi. I love these, basically mango ice creme without the ice. 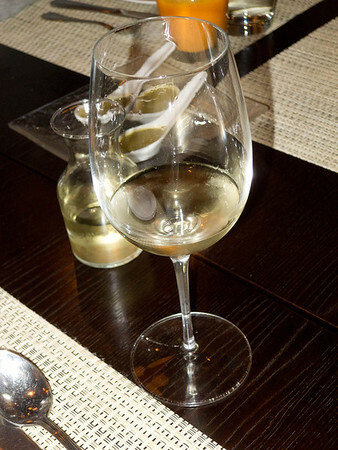 Riesling always goes well with Indian. 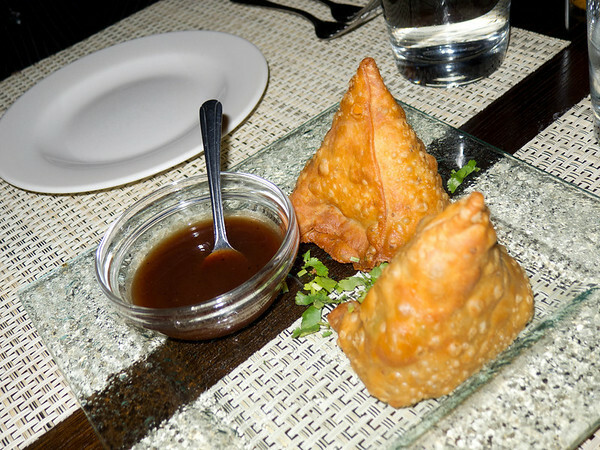 “Samosas. Crisp potato patty stuffed with spiced peas, served with Tamarind chutney.” These are stuffed with potato, peas, onion, flavored with curry and turmeric. As always the sauce makes the dish — sweet and sour. “Chicken Kati Roll. 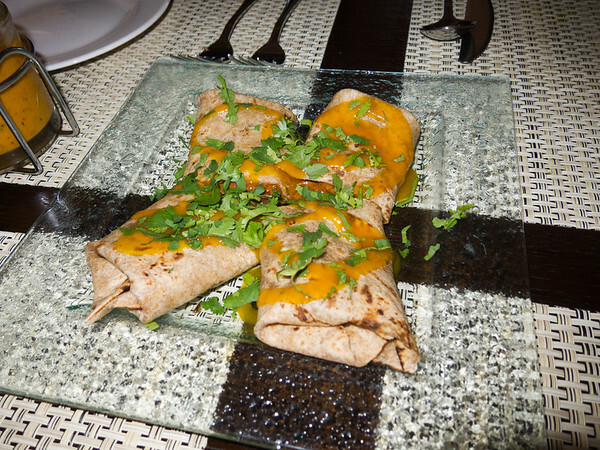 Whole wheat roti stuffed with highly spiced diced chicken , onions and tomatoes.” These little burrito-like fellows are actually from a different meal (lunch on January 28), but I put them in because they’re damn good. Stuffed with something akin to the Chicken Tikka Masala (see below), and then coated in sweet mango sauce and a bit of Coriandrum (Latin for Cilantro) they have a sweet/spicy/tangy vibe that I love. 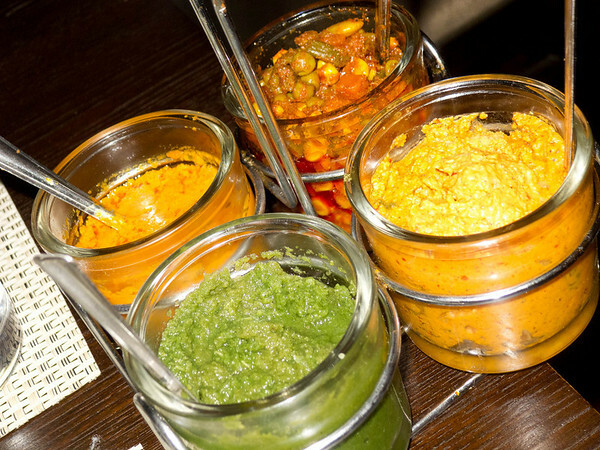 Akbar has an array of “pickles/chutneys” that come free. Coconut, mint, tangy, and the back one — my favorite — the pickled succotash in deadly hot oil. I love the stuff, so much that if I ate as much as I would like, I’d feel the burn for days. “Bhartha, tandoor roasted eggplant sautéed with tomatoes and peas.” This is like an eggplant korma or something. It’s salty savory, with a very pleasant texture. Cauliflower sauteed with onions and spices. 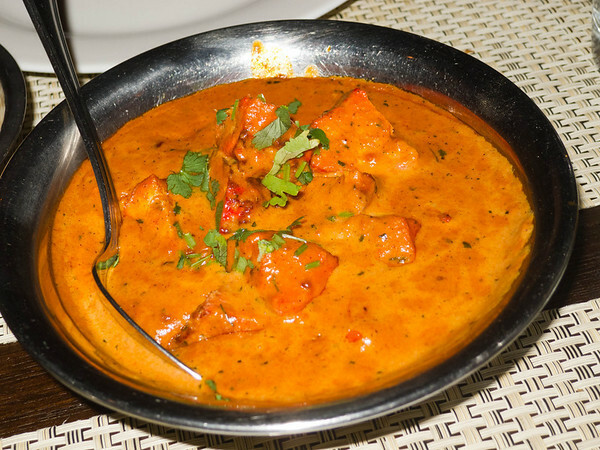 Chicken Tikka Masala.” Chunks of tandoor grilled chicken breast in butter tomato curry. This is the best CTM I’ve had — and I’ve certainly had plenty. Not every time you come, it’s always good, but sometimes it’s great. You can tell the spices have been fresh ground, and often big chunks of cinnamon can be found. Tonight we had it mild, but I would have liked it up a notch or two. 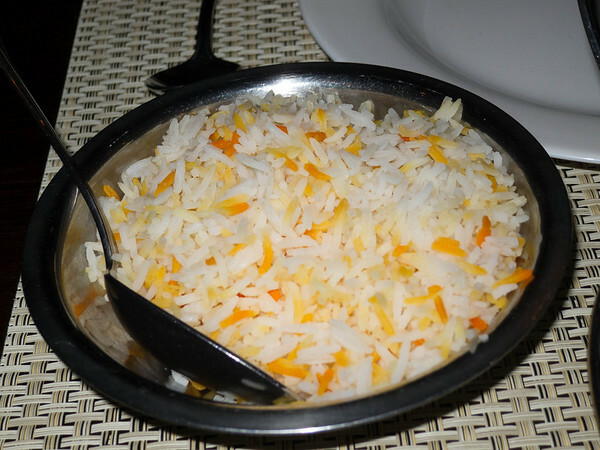 Basmati rice, Aromatic rice infused with saffron. 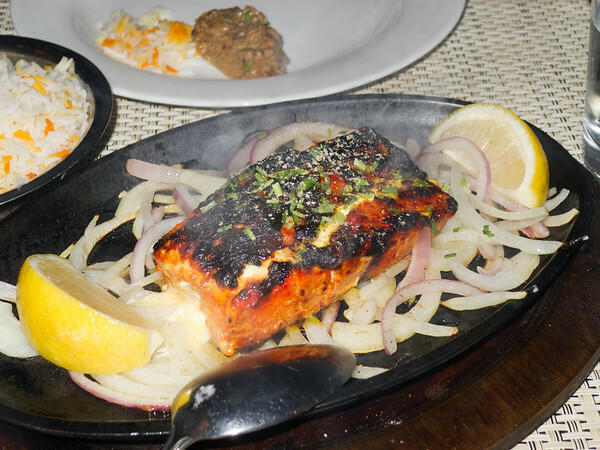 “Chilean Sea bass marinated in herbs and grilled in the tandoor.” This is a relatively unusual dish, and delicious. 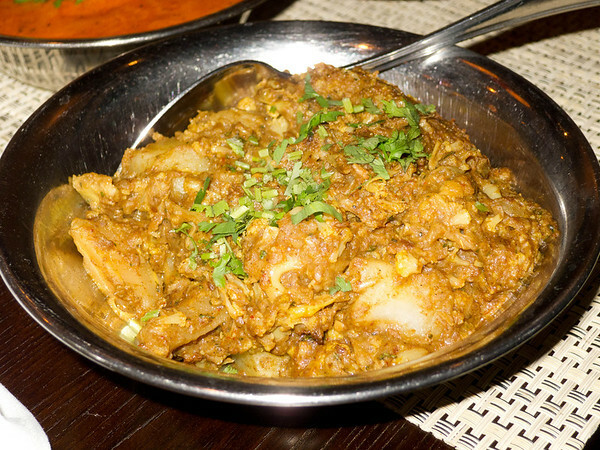 The fish is buttery soft, and pleasantly spiced without being spicy. 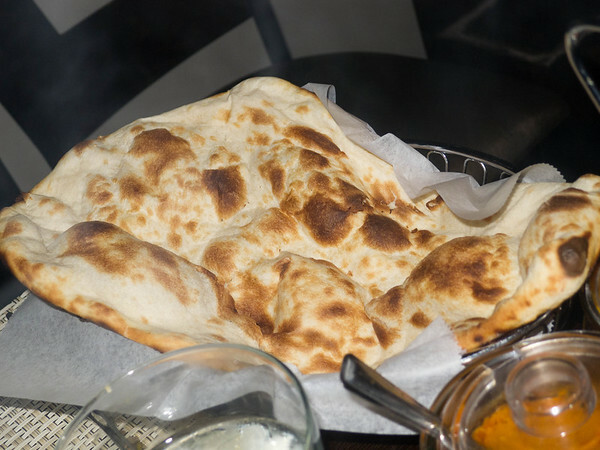 Classic Naan, baked to order. Perfect to dip in the CTM sauce, or to slather with the spicy pickles. This entry was posted in Food and tagged Akbar, Chicken tikka masala, Cook, Coriander, curry, Food, Home, Indian cuisine, Kati Roll, Naan, Restaurant, Restaurant Review, Samosas, side dishes, soup, Soups and Stews, Spice, vegetarian.